I’m so excited to share with you today about SFG’s impact in Haiti! 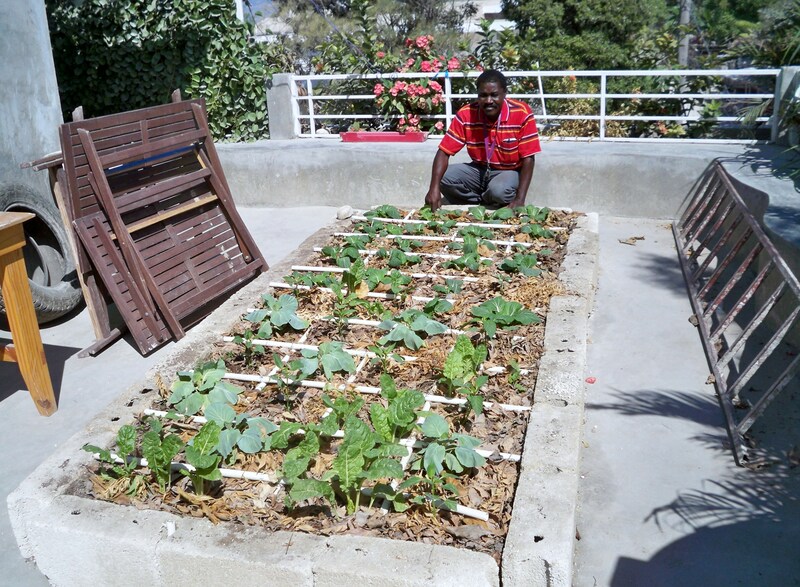 Wilky Estinvil, Yvette Papillon, and Pat Lahr’s organization Gardening World Wide has utilized the SFG system in Haiti since their beginning there in 1985. Gardening World Wide teaches SFG to aid the hurting in their road out of poverty. I actually got to visit them in Haiti in 1987 and was very impressed and encouraged by their work. Gardens are used for nutritional and educational purposes. Many young men go directly to Yvette for assistance and help in life. Wilky and his assistant teacher, Celidon, have done a tremendous job this past year coordinating SFG seminars to teach fellow Haitians “How-To” do a better job gardening from composting to harvesting. They’ve hosted two 3-day SFG Seminars in communities on the outskirts of Port-au-Prince where attendees were hungry for information and the free lunch. Wilky and Celidon also work with school children, installing SFG rooftop gardens and incorporating SFG into math classes and all school subjects. There are so many fantastic projects going on in Haiti surrounding Square Foot Gardening! Wilky, Yvette, and Pat have extended an invitation to visit and volunteer with them in January of 2014. Contact the coordinator, Connie, at 320-963-3690 or pclahr@yahoo.com if you are interested. Gardening World Wide had their 22nd Annual Promotional Fundraiser this past weekend in Minnesota with delicious barbecue pork sandwiches, relishes, zucchini chocolate chip cookies, Arabic coffee straight from Haiti, pure vanilla, entertainment, baked goods, horseradish, sauerkraut, and inspiring stories about how Square Foot Gardening is improving lives in Haiti. If you didn’t make the event but would like to support these efforts in Haiti, checks can be mailed to Gardening Worldwide 501c3; 208 Oak Avenue North; Maple Lake, MN 55358. I’d like to thank Gardening World Wide for using Square Foot Gardening to combat poverty, fight hunger, and improve education in Minnesota, Haiti, and worldwide. Check them out at http://www.gardeningww.org/ . Thank you, our friends in Haiti appreciate all the support received. We had a beautiful Haiti Mini-Market in Minnesota and continue to welcome your input for gardening. Also, anytime you wish references for Haiti, we are happy to please. Just email, let us know. My daughter lives in Jacmel, Haiti where she is “mom” in a children’s home. They have one boy in the home who loves to grow things. I am going to try to hook him up with SFG when I go back down. Haiti is a great place to start a SFG project. Heres a couple of good reasons: 1-Kids love to garden 2-Haiti has great weather 3-We already have a lot of projects in Haiti and perhaps people you could contact to get you off to a good start, depending on where your daughter is. I’m going to give you a contact of a couple in Minnesota that go to Haiti every year starting Square Foot Gardens: (pclahr@yahoo.com) I’m hoping they will be able to help you with, first, advice, second, special ideas that would apply to the Haiti location and third, someone to contact before you go and meet when you get there. In the meantime, if they have the internet, they could have the boy go to our website and start learning all about SFG. The next step would be to find someplace on the property where he would have a safe garden spot, and its possible to even get him started with a composting operation from thier kitchen, so that would all be done before you arrive. Hope that works out for you. Please keep us posted, especially with pictures when you go down to Haiti, to visit. We have been to Haiti twice and sponsor children there. We have been saying SFG would be great there. So excited to see this! Thank you so much for your letter, and I’m pleased you have been to Haiti and sponsored children there. Now the next time you go, you can take them Square Foot Gardening! Remember that children use a 3×3 and we have a couple Pat & Connie that go to Haiti every year. 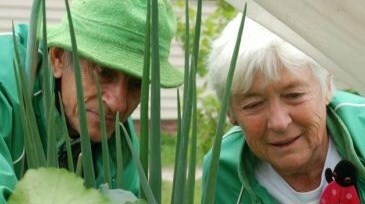 They have been working there for many, many years and taking Square Foot Gardening. If you would like their help to suggestions please let me know and I will pass your letter onto them. They go every winter, and maybe we should offer an invitation to anyone else out there who reads this. Would you like to be a volunteer that can help an organization go to Haiti and teach Square Foot Gardening? I’ve been there several times and it is an exciting place to be, it is lush and beautiful. Only one problem, they have cut all the trees on the hillside because they use them to make charcoal for cooking. That has always bothered me. I thought if we could just get everyone in Haiti to eat raw vegetables as a salad they wouldn’t have to cook it. That way they wouldn’t have to make charcoal and wouldn’t have to cut their trees down. Just another reason why one of the things in my next book, which is titled Square Foot Gardening to the Rescue, can solve 24 worldwide problems just by having a Square Foot Garden in every household. Thanks for your letter and let me know the next time you go to Haiti. We would be glad to help!